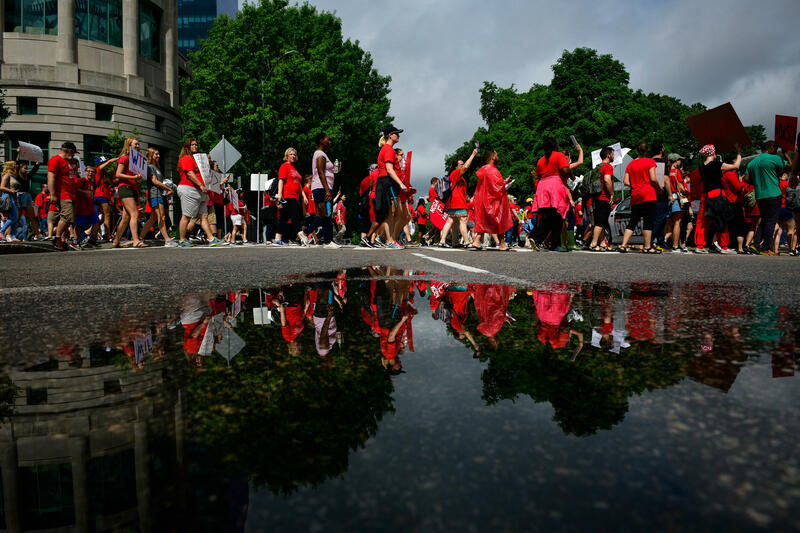 Teachers and supporters hold signs during a 'March For Students And Rally For Respect' protest in Raleigh, North Carolina on Wednesday, May 16, 2018. The Education Secretary chose not to stop by any public or charter schools in the nation's largest school system on her visit to the New York City area this week. Instead, she visited two Orthodox Jewish private schools. Who is left to investigate for-profit colleges? Last week, we got the news that the federal Consumer Financial Protection Bureau will reorganize its unit charged with investigating predatory student lenders and for-profit colleges, a move that triggered worries from current and former staffers that the office's work will be undermined. This week, The New York Times reported that the Education Department has effectively braked on its investigations into several large for-profit college companies as well — like DeVry, Bridgepoint, and Career Education Corporation. DeVos has hired officials who worked at all three companies. Several state attorneys general continue their probes into Bridgepoint, CEC and others. And, several Obama-administration student investigators have formed a nonprofit organization, the National Student Legal Defense Network, dedicated to litigation and advocacy on behalf of defrauded students. Thousands of teachers marched on the North Carolina state capital, Raleigh, on Wednesday asking for better pay and better funding. NPR reported on what one analyst, the Brookings Institution's Michael Hansen, called a "domino effect": "the Democratic midterm wave elections, the women's #MeToo movement. There are just a lot of big movements happening here." Or in the words of Melissa Easley, a seventh-grade science teacher in Charlotte: "The legislature has asked us to do more with less. We are at our max, we can't do anymore." Since February's shooting at Marjory Stoneman Douglas High School by an ex-student with a long disciplinary record, questions have been raised about the district's behavior policies. Broward County Public Schools uses a program called PROMISE, focused on "eliminating the schoolhouse to jailhouse pipeline" by handling nonviolent offenses through school resources and programs. Desmond Blackburn advocated for PROMISE, increasing mental health supports, and reducing suspensions and expulsions as the chief school performance and accountability officer of Broward County. In 2015 he became the superintendent of Brevard County schools, farther north on Florida's east coast. Gov. Rick Scott recently named him to serve on the Marjory Stoneman Douglas High School Public Safety Commission, charged with studying the tragedy and making policy recommendations. But on Monday this week Blackburn announced his resignation from Brevard. He will lead the New Teacher Center, a national nonprofit based in California. Colleges and universities are hiring consultants to advise borrowers on how to avoid defaulting on their student loans — but these consultants don't always help students. That's according to the U.S. Government Accountability Office, a federal watchdog agency. An institution can lose its ability to receive federal student aid if too many students default within a three-year period. So some school-hired consultants encourage borrowers to put their loans on forbearance — allowing them to postpone payments, and thus postpone default. But this is just a temporary fix. Borrowers who go into forbearance typically end up paying more in interest and simply defaulting down the road. According to the G.A.O. report, some consultants gave borrowers false information to steer them toward forbearance. Others contacted borrowers unsolicited with a forbearance application, and one even "offered borrowers gift cards as an incentive to put their loans in forbearance."